The following policies, terms and conditions provide a formal structure for clear and consistent project communication and decision making, ensuring efficient organization and management for your project. The Interior Designer or Decorator will provide to The Elegant Window the necessary information for a detailed quote of their project. Please send a quote request via email or fax. Site measure and design consultation will be billed at $75 per hour. There will be an additional charge of $1 per mile for job sites that are outside of a 30 mile radius from The Elegant Window. Following the consultation, and once designs have been formulated and agreed upon, a detailed written estimate, including yardage required and labor costs, will be provided via email or fax. It is your responsibility to carefully read over the estimate to make sure all details are included. Subsequent corrections and/or changes must be requested in writing. When final, the estimate is valid for 30 days. Design consultations and site measures are billed separately from further project work, and before it commences. These charges are due upon receipt of invoice. The designer may issue a written purchase order but The Elegant Window will also require 1) the estimate to be signed to indicate acceptance of the estimate with the described services and fees, and 2) returned with the required 50% deposit before the project can be added to the workroom schedule. A completion date will only be given when all components required for the job have been received. Lead times vary, typically from 3 to 8 weeks, depending on the scope and complexity of the work. With sufficient notice, The Elegant Window will do what it can to accommodate the designer’s preferred installation date. Rush orders can be requested and are possible if the workroom schedule permits, however 100% of the payment and a 30% production surcharge are required at time of order. It is requested that fabric and trim memos – at minimum, swatches – be provided as well as: information on manufacturer, name, reference number, color, pattern repeats (vertical, horizontal, half-drop, railroaded), fiber content, direction and face. Suitability for purpose and construction methods can only be determined by direct knowledge of the fabrics and trims. Also, please indicate if this fabric or trim is being used for anything else – for example: upholstery, wall upholstery, or in conjunction with a matching wallpaper. Please provide information regarding the firm doing this related work in case coordination of construction details is required. After the estimate is signed by the client and the deposit is received by The Elegant Window, requested changes or additions to the final order must be submitted in writing and will constitute a change order. Change orders will incur an administrative fee of not less than $25 which does not include fees for any new consultation, measuring, research or additional estimating services necessitated by the requested order or addition. As with the initial estimate, The Elegant Window will only proceed with a change order upon written approval for its additional costs, and upon receipt of payment for any additional consulting, measuring and estimating services thereby incurred. Changes requested after a project has been cut may not be possible. Change orders may also affect the scheduled delivery date. Cancellation of an order that occurs before fabric is cut, or before goods have been ordered, will be honored and the deposit refunded less an administrative fee of 5% of the order, but not less than $100. After fabric has been cut and/or goods have been ordered, the designer is entirely responsible for the original orders payment in full. A 50% down payment is required and the balance is due upon completion, regardless of installation schedules. The Elegant Window accepts payment by check, Visa or Master Card. Payment by Visa or Master Card will incur an additional fee of 3% of the total bill. Returned checks will incur a fee of $35. Past due balances will be assessed a finance charge of 1.5 percent per month. In the event any invoice is not paid when due, and legal action becomes necessary, the prevailing party shall be entitled to their reasonable attorney fees and court costs. It is expressly agreed that if an invoice is not paid and referred to a third party for collection, the additional cost will be borne by the signer. The Elegant Window will provide a detailed quote for labor and yardage, but in order to do so, we require a memo sample of the fabric and trim. This enables us to accurately determine the proper method of construction and will help us advise you regarding the suitability of the fabric for your project. When we have not had the opportunity to see your fabric, our estimate is just that – an estimate – and is based on using fabric and trim that is non-problematic and should be understood as a rough estimate only. We carefully calculate yardage for your project and this is done as a courtesy. In the rare event that there is a shortage of fabric or trim, The Elegant Window will not be responsible for purchasing additional fabric or trim. Some fabrics and trims are difficult to work with and require special methods and handling. The more information we have at the time of estimating, the better we are able to give you an accurate quote. The following fabrics/trims may require additional charges: velvet, silk, crinkle, chenille, open weaves, leather, fur, embellished fabric, embroidered fabric, fabrics with small tucks or pleats, some sheers, upholstery weight fabric used in non-upholstered items, beaded trim, open weave trim that requires hand sewing or any fabric or trim requiring extra care in handling and fabrication. Extra work such as piecing fabric, blocking fabric (this is done when fabric is off-grain), pressing flat folded fabrics or heavily wrinkled fabrics, working around flawed fabric, hand sewing, pattern drift, or fabrics that require interfacing or stabilizer products, that could not be anticipated in the initial estimate but prove to be necessary in the construction of the product will incur additional charges. Yardage calculations for print fabrics that require a specific motif to be centered on valance components such as scallops or horns or for draperies pleated to pattern, please submit a sample of the fabric that is one whole repeat by one full width. We can estimate yardage without this sample of fabric but the sample will provide us with all the necessary information to give you an accurate quote for yardage. If you require additional quotes for labor and/or yardage in order to provide your client with other options for the same window, bed, or accessory or if you need us to figure how much yardage is required from multiple bolts of fabric in order for there to be enough yardage for your project, we will need to charge for the additional time required for these quotes. If you are drop shipping merchandise to us, the fabric must be clearly marked with your company name and job name (sidemark). It is also helpful to mark it with the room it is to be used in. We will need the name of the fabric/trim and the amount of yardage ordered as well as a swatch (at minimum) of the fabric/trim in order to verify that the correct fabric/trim and the correct yardage has been sent to us. We have been sent the wrong fabric before with the “correct” fabric name and color listed. Additionally, we will need a swatch of the fabric marked as to which side is the right side and the up direction. If we are not provided with this information and we do our best to choose the “right” side and the “up” direction, we will not be held responsible if the product is made and you then inform us that we used the “wrong” side and the “wrong” direction. The Elegant Window carefully inspects all fabric over a light box when received for flaws and correct yardage. In the event we find a problem, we will notify you as soon as possible. We will do our very best to find the flaws that may be in your fabric but if a flaw should escape our inspection, we will not be held responsible. The Elegant Window will not be responsible for excess fabric or fabric storage. Your fabric will be returned to you after completion of your product, upon request. All material will be held for 30 days after installation. After 30 days, all fabric will be donated to local charities. Production scraps will not be returned. Interior Designers can request excess fabric be delivered with the install or pick up at workroom. The Elegant Window does not warranty any window treatment from fading. Colored linings supplied by The Elegant Window are also subject to fading. The Elegant Window is not responsible for fabrics that may change in appearance when sunlight shines through the fabric. Additionally, lining color may also change the color of the face fabric when sunlight shines through the fabric. We recommend you place the fabric sample with a lining sample in the same light as your final application to determine true appearance. Textiles have inherent characteristics that are out of The Elegant Window’s control (ie., stretching, shrinking, wrinkling, stiffness, flaring, hiking, dye lots, back light shadows and imperfections such as slubs and uneven weaves,). Be aware that no fabric is completely stable and draperies may drop in length over time or shrink as it is the nature of soft fabric. In the event that a drapery has stretched or shrunk after installation, the seller or purchaser of the fabric will be responsible for necessary adjustments. Additional charges will apply for re-hemming. Some fabrics made from man-made fibers inherently resist creases and folds. This characteristic may cause draperies to flare, even after proper “dressing” or “training” of the treatment. In the event that a drapery flares, and will not “behave” or hang without flaring, the seller or purchaser of the fabric will be responsible for necessary adjustments. Please inform us of the fabric content during the quoting stage and we can add to your estimate a “memory stitch” at the hemline and also extra weights in the hem. This will help control flaring. We can advise the designer regarding his/her fabric choices, drawing upon our years of experience with working with various fabrics and treatments, but ultimately the designer is responsible for the suitability of the fabric to the treatment or poor design choices. The interior designer is responsible as to how the fabric hangs. We will not be responsible for the present or future behavior of the treatment/fabric such a wearing and deterioration, stretching, shrinking, staining, cleanability, fading, or damage to person or property. Scheduled deliveries or installations that are delayed due to circumstances beyond The Elegant Window’s control (such as construction schedules) may involve storage of goods; in this circumstance, charges for storage will be made on the basis of quantity and type of goods. Also, surcharges to the original order may be required to cover multiple installation visits to accommodate said unforeseen project and/or site circumstance. Any type of shade will have light gaps around the shade. This is the nature of a shade. We suggest you use the term “room darkening” rather than “blackout” if you are selling your customer a shade with blackout lining. Outside mounted shades can be “reverse mounted” to minimize light gaps around the shade. Flat Roman shades that are lined with blackout lining will show pinholes of light where the rings are stitched onto the shade. This is the nature of blackout lining. Alternatively, flat Roman shades may be specified that are made with the French blackout method (face fabric, interlining, black lining and lining) or a double-sided Roman shade may be specified if you feel your customer will be opposed to pinholes of light on blackout Roman shades. If you specify a flat Roman shade lined with blackout lining, it is your responsibility to inform your customer that pinholes of light will be seen throughout the shade. All shades will be manufactured according to current safety standards. The products made by The Elegant Window are custom made to order and cannot be returned for any reason. If there is an error on our part, claims must be made within 30 days of installation. The Elegant Window reserves the right to determine how the correction will be made. Replacement products will be made only to original specifications. 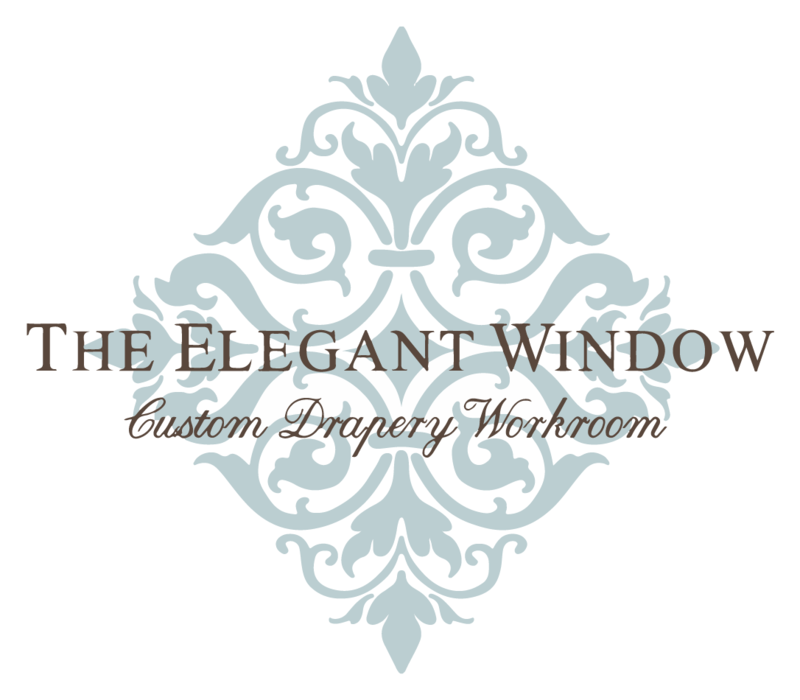 Custom products that have been modified by another workroom or seamstress are no longer warranteed by The Elegant Window. Remakes or reworks due to error on our part will be prioritized into our workroom production schedule. Remakes or reworks due to customer error will incur labor charges of $50 per hour. We will do our best to prioritize your projects into our productions schedule as soon as possible.